Sending package to Belarus is very simple when you use the low cost courier service provided by Courier Force. We provide courier to Belarus for individuals as well as companies. Our clients keep coming back to us for the quality of our work and also for unbeatable prices. Cheap parcel delivery to Belarus can be booked in no time by just mentioning the weight and dimensions of the parcel. Many people now choose courier services to send their parcel to Belarus simply because of cheap rates and good service. 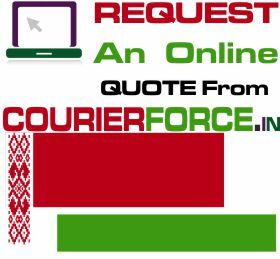 Whether you regularly send parcels or are sending parcel for the first time courierForce guarantees you that you will be completely satisfied with our services. We have tried to make the parcel delivery process as simple as possible for all our customers. All the necessary information about the pricing and delivery is provided on our website. Yet if you are stuck anywhere you can ask assistance from our live chat team or simply request a call back or email your enquiry. Whatever your budget is Courier Force will provide you with the cheapest rates in the market. We work with only the very best courier companies like DHL,TNT, FedEx which helps us to get best rates for you for your parcel delivery to Belarus. So book your parcel with us and get discounted rates for parcel delivery to Belarus. Prices below are door to door courier rates to Belarus from India. These charges are cheapest in India for sending courier to Belarus from India. This is by a courier company which is the best in industry for parcel services to Belarus . Again, Courier Force is one of the very few companies who have their own network for distributing parcel in Belarus. It will take anywhere between 3 and 6 working days to deliver your parcel to Belarus from India. We will be simply collecting the parcel from your business or residence in India and delivering it to your destination address in Belarus. Duties, taxes and customs charges if any (in Belarus) will be additional.